It's easy for analysts and journalists to manipulate data to find patterns where none exist. It's your job as an intelligent investor to question everything. You're about to see three charts. Try to figure out what they all have in common. Source: St. Louis Fed and author's calculations. What do these three charts have in common? They should all be completely meaningless to rational investors, because none of them show two variables that are actually related to each other. Sure, the first chart seems compelling at first glance, because humans are visual creatures. Look at that scary chart! 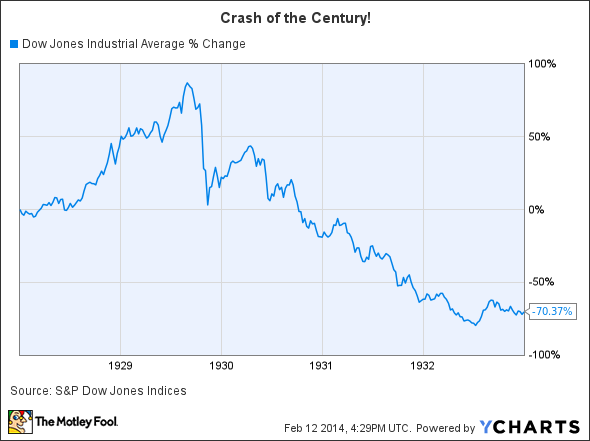 Doesn't the Dow look like it's doing the same thing it did in 1929? Sure it does, if you mangle your variables badly enough. But as has already been pointed out multiple times, the Dow really isn't following 1929's pattern -- you can see what's really happening over similar time frames on the second graph, which shows a far more modest gain in today's Dow than the wild surge that preceded the worst crash in history in 1929. It's easy to find patterns where none exist, especially if you set out to force a pattern to fit your thesis in the first place. There's even a psychological term for this search for patterns: apophenia, which was originally used to characterize psychotic or schizophrenic delusions. Gamblers often experience an apophany -- the opposite of an epiphany, since you think you really get it but really don't -- when they believe that an unlucky run must end for the sake of balancing some cosmic scale. Traders who rely on "chart patterns" are always eager to share their apophanies with you on blogs or social media, because there really are a million different ways to make a squiggly line look like it's going to squiggle the way you want tomorrow. There are a million different ways to make a bunch of numbers say what you want them to as well, if you're clever enough with the construction of your chart. Zach Weiner, creator of the Saturday Morning Breakfast Cereal webcomic, has a strip that perfectly captures the problem afflicting much of the news media today: "According to the fundamental law of media graph construction, any two things that look correlated on a graph are causally related in real life." That's what the third chart is in this article. It means absolutely nothing, but I fiddled with the Y-axes until both of the lines followed the same path. Do 1929 and 2014 look similar? Sure, on one particular graph, if you tweak the variables long enough. Is there a direct relationship between 1929 and 2014 when it comes to market movements? No. It doesn't matter if you're talking about stocks, commodities, demographics, or just two random sets of data that happen to be paired up on the same chart -- the Internet is full of articles that claim to find patterns in data where none exist. Dow Jones Industrial Average data by YCharts. 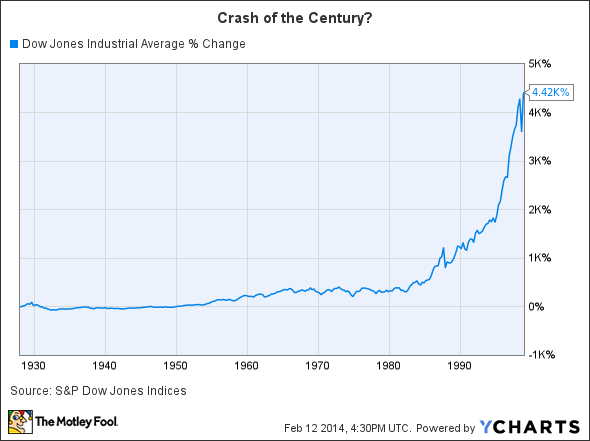 The first graph shows how terrible the Crash of 1929 was for everyone who lived through it. The second graph shows just how negligible that crash was on the Dow's longer-term history. Neither of these graphs will help you become a better investor, unless you look at both of them and realize that there's not much point in freaking out about market drops if you plan to stay in for the long haul, and that there's no reason to go hunting for meaning in data that doesn't actually drive market moves today. Numbers might not lie, but charts can and often do -- or at the very least they can tell an incomplete story. That's not to say that charts have no value, but you'll often have to do a little bit of legwork to separate what matters from what's meaningless. Or you can take everything at face value, until you wind up believing that your investments will rise along with the population of monkeys in Madagascar.